Why is the quality value range so broad (94 levels)? In a particular case of analyzing data, we saw, the frequency of I is so high, which is not a good quality. So, why would we accept such a poor quality in research? Character I denotes a phred score of 40. Aligners, when they read fasta files, by default assign a score of 40 (I) to all positions. This might be one why reason you are seeing a lot of I.
Anyways, if your fastq follows the phred+33 format then 40 (I) is a pretty good score which denotes a good quality read. Or you could be aligning fasta files. It would be a bad score if your encoding is phred+64 which I guess, is not the case. Usually, you'll have two files for 454 experiments — one that holds the sequence and the other that holds the quality at each position. These files can be combined to generate a fastq. This file is encoded in the phred+33 (also called Sanger/Illumina 1.9) format which I mentioned above. Phred+33, I guess, is also the standard encoding format adopted by NCBI/ENA/DDBJ and all new sequencing runs are encoded in this format. If you do not know the encoding you can run fastqc on your fastq file and it reports the type of encoding. In your case, I would denote a score of 40 (ASCII value - 33) which means an error rate of 10-4 i.e. the read is of good quality. The below graph is obtained by a fastqc run on your file. The bars denote quality statistics at each position. Note that the mean quality drops towards the end of the read. 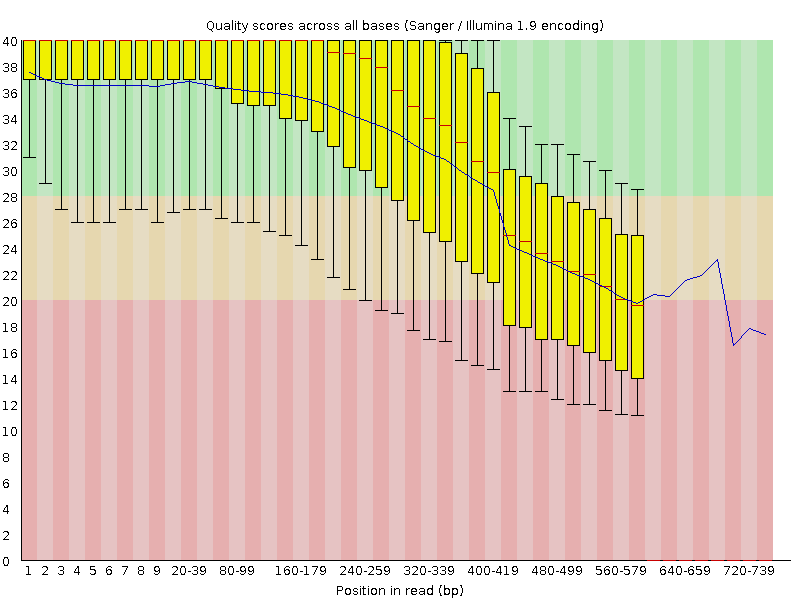 A fasta file does not indicate quality but when you map them to your target, the aligner (I know of Bowtie based ones) assigns a default score of 40 at each position, during the alignment (and in the output). As mentioned by @WYSIWYG in his answer the quality scores in FASTQ file format are encoded in ASCII characters, and there has been several ways to encode this information. The wikipedia FASTQ page that you link in your question describes some (not sure if all) the different alternatives. So, if your base call is truly wrong (probability of error p = 1) then q = 0. If your base call is certainly correct (p = 0) then q -> Inf as p -> 0. Imagine your probability of error is p = 0.0001 (that is, most likely the base is correctly assigned). Then q = -10 * log10(0.0001) = 40. Therefore, a score of q = 40 means a probability of error in that base call of 1/10000. Quality scores are considered, as far as I know, between 0 and 40. Now, another issue is how to include this information for each base in the FASTQ file. It would take too much storage space to include the score as a real value number (i.e. with decimals). A possibility instead is to round it- after all there is no much difference between a score of say 39.7 and 40- we care more about the order of magnitude. But then we will have to still store two digit integer numbers per base. What we can do is map the rounded score to the corresponding ASCII character + some offset. That is, as you can see in the FASTQ page the ASCII value for character I is 73. If you are using phred-33 encoding this actually means that character I = 73 corresponds to quality score q = 73 - 33 = 40, which means p = 0.0001. Voila. Character ! = 33 represents score 33 - 33 = 0 (p = 1). In a phred-64 representation a score q = 40 is encoded with character h = 104. Then q = 104 - 64 = 40. Ewing B, Green P. Base-calling of automated sequencer traces using phred. II. Error probabilities. Genome Res. 1998 Mar;8(3):186-94. Not the answer you're looking for? Browse other questions tagged bioinformatics sequence-analysis nucleic-acids or ask your own question.